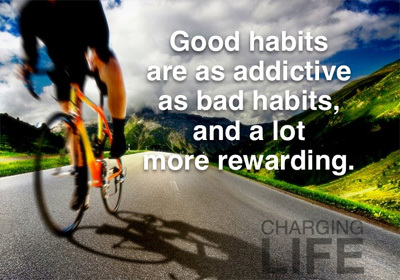 We all know that good habits reap goodness in our lives and that bad ones do the opposite. 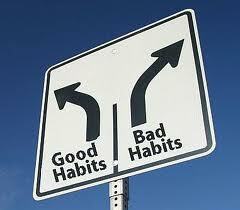 As many of us have experienced, bad habits can have lasting, damaging effects. But like many things, forming good, healthy habits is easier said than done. It’s easy to resolve to change things for the better, but it’s much harder to stick with it over the course of time. The dilemma, it seems, is finding ways to sustain a lifestyle of healthy habits. Canfield, Hansen and Hewitt stress that the key to identifying bad habits is being honest about long term consequences, not necessarily things that would show up tomorrow. “The real impact could be years away,” they point out. It’s easy to ignore bad habits that don’t have immediate consequences, but that’s exactly where their power takes hold of our lives. We must instead look ahead and see how the choices we make now will impact the future. In the same way we looked to the future when identifying bad habits, we’ll also look forward when we implement good habits. Looking forward “helps you create a clear picture of what this new habit will do for you. The more vividly you describe the benefits, the more likely you are to take action.” Again, this is the way we stay strong with good habits: picturing the rewards and aiming for them. Take the time to sit down and map out your new set of good habits, thinking about the great things you will achieve when you adopt them. It’s good to start small, so don’t overwhelm yourself with tackling multiples habits at once. After all, the brain can only handle so much! Focus on one habit at a time, only moving on when you feel that you’ve successfully installed it into your routine. You’ve honed in on areas in your life you want to improve, deciding to take different (usually opposite) courses of action to beat out bad habits. Now, you’re ready to get the ball rolling. Take the time to “make a decision about which specific actions you are going to implement.” Each person’s three-part plan will be slightly different, and it is up to you to determine what works best for you. Some people’s three-part plans might actually have five parts to them, since the number of steps isn’t really what’s important. The important thing is that you visual specific actions. How can you really realize your goal of implementing a new habit? What actions will boost chances of success? The action plan will propell you from visualizing changes you wish to see, to actually feeling empowered to make them. What’s more, having a written copy of your plan works great as a visual reminder or reference for those days you’d like to slip back into bad habits. Vital to the success of your action plan: setting a start date. 1. Design my work better by not overcommitting. 2. Delegate secondary tasks to staff to free up my time. 3. Have my family keep me accountable. No golf if I don’t follow through! As with any change we make in our lives, repetition is key. To make better habits, you’ll have to keep fighting the brainless tendency we have to continue the bad habits we’ve created. This may be annoying at first, but if you stick to the action plan and keep your focus toward the future, you’ll soon find that you’re actually doing the good habits without having to think about them. Think about how good that will feel! Canfield, Jack, Mark Victor Hansen and Les Hewitt. The Power of Focus. Florida: Health Communications, 2011.